This cozy home is available for Easter , July 4th and Memorial Day weekend! Spring is here, and the Cove is alive with wildlife. Charter fishing is walking distance away. This is It Cottage is perfect for a get-away. This peaceful cottage offers the perfect spot to relax and enjoy the outdoors, with ample room for children to run and play. It is amazing what you see while sitting on the deck looking over the cove. This it It Cottage is located on a cove off the Little Wicomico River in the Northern Neck of Virginia. The Chesapeake Bay is accessible by boat. There is a boat and Jet Ski launch within a quarter of a mile of the cottage. Vir Mar Beach is 3 miles away by road. This cozy Cottage is decorated with hand-made quilts, has spectacular views, a private dock, and offers peace and quiet. This is a no smoking home. Ash trays are provided outside. This is it Cottage is a great place to call home during your next visit to the Chesapeake Bay. This property is right next door to Little Wicomico Cottage (7084007). Please see the reviews. You will be taken care of with the same care and attention. There is a downstairs bathroom and an upstairs bathroom in the master bedroom area. This home is located in the rural Northern Neck of Virginia. 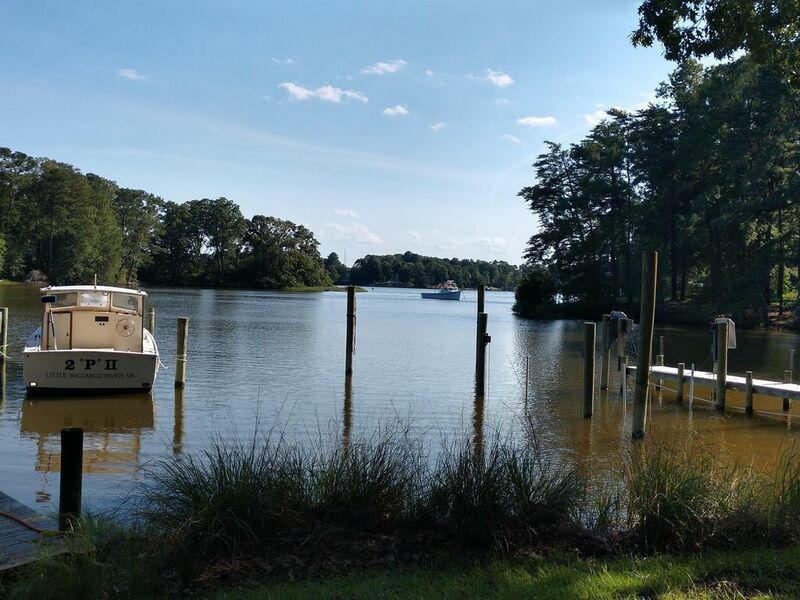 This property is located off of the Little Wicomico River on a quiet cove. It has its own dock. A selection of videos are available for your use. We love it. Nice house. This cottage was a beautiful slice of heaven on earth. My husband and I were able to fulfill a dream coming to Virginia.The location on the water is awesome for nature lovers and the cottage was warm and cozy feeling at the same time. I can’t say enough of how lucky we were to find this gem as well as the folks running it. Don and Arlene are kind and were quick to help us with any and all needs when arriving. Beautiful, Beautiful, Beautiful!!! We would recommend this to families, couples, travelers and for any and all. Peaceful , Great for our family! We so enjoyed our stay at "a slice of tranquility" ! I almost want to keep it a secret and not share how much we enjoyed it !! hehe. The house was not updated or new but was clean, peaceful and just a relaxing place to stay! The only thing that would have been nice is if the house would have had a grill but really we had everything we needed there. We took our own little boat and put it in the river just up the road from the house and was able to tie it at the dock behind the house ..... That made it so nice! We were able to enjoy the water during the day without ever driving our car anywhere! It took us about 10 minutes by boat to get out to the bay and there was a nice little beach where the kids could play . Our kids loved the house and said it felt like going to Nana's house !! Thats a great compliment because they love their Nana :) We love to travel to new places so we are not sure when we will be back to this area but we enjoyed it so much that we will for sure save this to our favorites! Thank you again for the memories we were able to make with our family! We will never forget them! and the little surprises left for the kiddos in the kitchen upon arrival was a hit with the kids as well! Bring your Jet ski and enjoy the river. Bring your boat and water ski , fish in the Chesapeake Bay, or go to the beach by the Jetty.